Wonderful Yarn ... Great Savings ... What’s in the Bag? Each mystery bag will have enough coordinated and carefully selected yar n to knit one or more projects. Some of the mystery bags will focus on dyeing or spinning, but they will also include a project to knit. We have been known to put additional “freebies” in each grab bag, which makes them an even better deal. 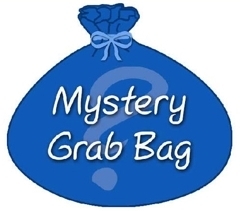 The mystery will be that you will not know which fabulous items are in the bag until you open it. **Retail value is based on the manufacturers suggested retail price. on our mystery grab bags. No returns or exchanges. Here is something fun that we now have in stock: Regia Creativ – Make a Change, wear the scarf while you knit it into a pair of socks! If you like knitting socks, but want something new to try, Regia Creativ is for you! Regia Creativ starts out as a single strand that is knitted flat and then hand dyed. The result is a knitted scarf that you pull the ready to ravel end to knit yourself a pair of socks. The scarf is actually very nice and can be worn, so if you need a last minute gift for the non-knitter, buy them a cute scarf. We have one production run of Creativ, and our supplies are limited to stock on hand. Regia Creative comes in six lovely color-ways, and is on sale for $11.20. Visit our Regia Creative page to find out more about this innovative yarn. 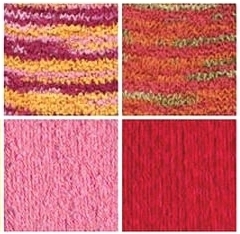 Are you looking for a yarn that will make a lovely baby sweater or blanket? Is the mother to be someone who you know will not hand wash your hand knitted garment? If so, try Regia Kids. Although we usually focus on natural yarns, we could not resist Regia Kids when we saw it knitted up. New mothers are very busy and often overwhelmed with the challenges of motherhood. Some may be fine with hand washing baby gifts, but we believe that the majority of new mothers welcome something that is easy care and can be machine washed. Regia Kids comes in vibrant solids and fun multicolors, and is a textured dk weight yarn. What is great about this yarn is that no fancy patterns or stitches are necessary. The natural texture of this yarn makes any plain garment something special. So, if you want a quick knit baby garment using stockinette or garter stitch, try Regia Kids. This yarn is on sale for $5.60 per skein, and can be purchased at our online store.